This amazing chateau, which was added to UNESCO’s list of world heritage in 1999, dominates the town and is the center of local history and cultural activity. The chateau gardens and grounds are open to visitors all year round and the interiour is accessible on regular guided tours during the warmer months. There are two tours for the interior, during which you will see thirteen rooms in total, including the billiard room, the library, chapel and a rare baroque theatrette, which is noteworthy since it is one of only five working examples in the world. A huge crystal chandelier will also draw to your attention; it was created especially for Miloš Forman’s film Amadeus, and later donated to the chateau. Another highlight of the chateau is the intriguing exterior decoration. There are hundreds of square meters covered with sgraffito (a way of decorating a surface by scraping through a wet layer of plaster to expose a contrasting layer beneath). Abstract brick pattern on the walls of the chateau is juxtaposed with more figural representations of various legends and fables at the cornice, around the base of the roof, on the gables and chimneys. The admittance to the chateau gardens is free. 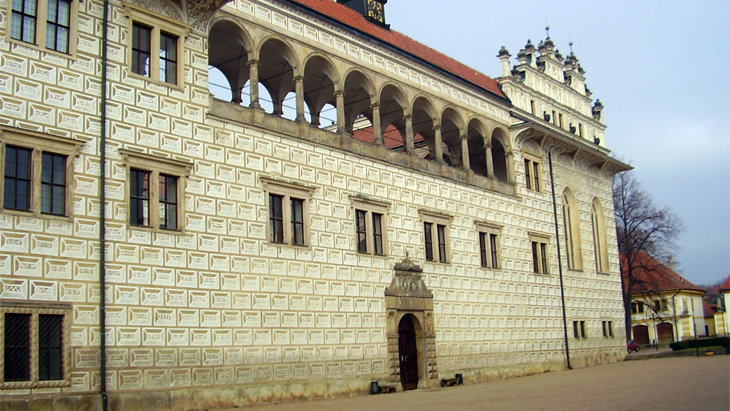 The entrance gate will lead you through an arched tunnel onto the gravel and pebbles in the main courtyard, where you will find the former brewery building, and family home of the renown Czech composer Bedřich Smetana. There is also small garden with statues, seats, some majestic old trees; it is from this place that you can enter the cellar gallery of Olbram Zoubek’s scultures. With so much to see around the chateau this place should not be missed on any proper visit to the Czech Republic.